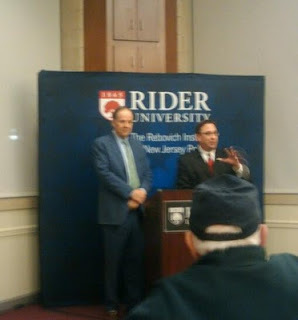 LAWRENCEVILLE--Tonight, Anwar's Reflections attended Rider University's event, The State of Politics Today, where former New Jersey Governor Tom Kean gave a speech followed by a question and answer session in the University's Mercer Room. The event was sponsored by the Rebovich Institute of Politics. During the former governor's speech, Kean gave an overview of how politics has evolved or changed over time. He noted how historical and economical changes have changed people's perception of politics. He argued that in the beginning politics was seen as one of the most noble professions, now unfortunately it is seen differently. He argued that events like the assassination of Martin Luther King, Jr. and John Kennedy have led to great disillusionment and cynicism on the part of the populace. He said that people have gone from being optimistic about politics to becoming pessimistic and cynical because the two political parties we have now, no longer know each other. Politics in his estimation has become hyper-partisan. 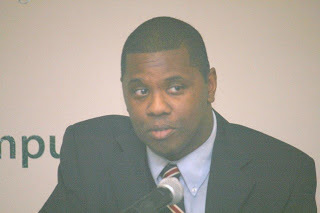 Kean argued that this sort of "social scene" has led to a new brand of politics that makes it all too easy to demonize one's opponent and thereby not listen to them. During his speech, he called for a different brand of politics that resembled his era, where people have the courage to listen to each other while at the same time respectfully voice their disagreements. The event was attended by a variety of people in the community that were willing to chime in and give their thoughts. One of the audience members, Sue, a nurse from Lawrence Township, said that the governor's speech was "enlightening". She went on to say that she came to the presentation in response to the current state of politics. She stated that, "In the current political climate, I've noticed that there aren't enough women in politics, I'm a real advocate for that. There's a real need for more women in politics. I think events like these expose the public to a variety of angles and attitudes that are informative". Another audience member, Blake, a Rider University student, said that he enjoyed the presentation because Governor Kean "stuck to the issues and was very well-spoken". The student went on to say that this event was important because "he [Governor Kean] makes it very apparent to the listener how politics has changed over time compared to the politics he's he's used to when he was younger. I think this speech has made us take a second look at how politics has changed over the years compared to what he's used to"
Another Rider student,Clyde, said that he enjoyed the presentation because Governor Kean "gave direct answers that may fix a lot of the issues affecting people now if they just listen to what he has to say". According to Tom Little, a student at the College of New Jersey (TCNJ), the presentation was "enjoyable" Little went on to say, "He [Governor Kean] talked about a whole lot of things from national policy to state politics. I really enjoyed all the questions and answers today, I really learned a lot about history and it just makes you more appreciative of having a governor that is willing to come down and give you his opinions on current issues facing New Jersey and the country in general" The TCNJ senior went on to say that he thinks thats "the Governor makes a point when he says that regardless of the challenges we face and the partisan nature of politics today we all have to work together in order to solve our problems, Clearly, he's a big believer in that, he has a track record to prove that, you have to stay in the center, you got to work together to fix problems in this country. I think his talk today is relevant given that he's right, you don't have a lot of people in the center today, and we need that moderate or centrist position to solve a lot of our problems". Anwar's Reflections will be sure to keep you up to date on any future developments.